Didn’t think I could grow without you, but here I am blooming. Looking at 2018 with my head up high. Here’s to accomplishing a few more dreams, giving a whole lot of joy and love, and taking on some bigger risks. I didn’t get to watch the Oscars last night, but I can say that I basically watched it from reading all the live updates from the event via social media (Twitter and Facebook – also, shout out to all my film major friends who had something to say every second of the Oscars. Truly thankful and not being sarcastic because I actually like getting a good insight of the Oscars from a film major perspective). While everyone was watching the Oscars, I decided to jump on the bandwagon late by streaming House of Cards on Netflix. I know, I know, I am way behind on all of this. It’s kind of a disgrace really because I currently live in the nation’s capital, and I couldn’t even take a second to appreciate what the hype was all about. Currently on episode 3, and I am hooked. Back to the Oscars, I thought I leave this accurate quote by Robert De Niro. 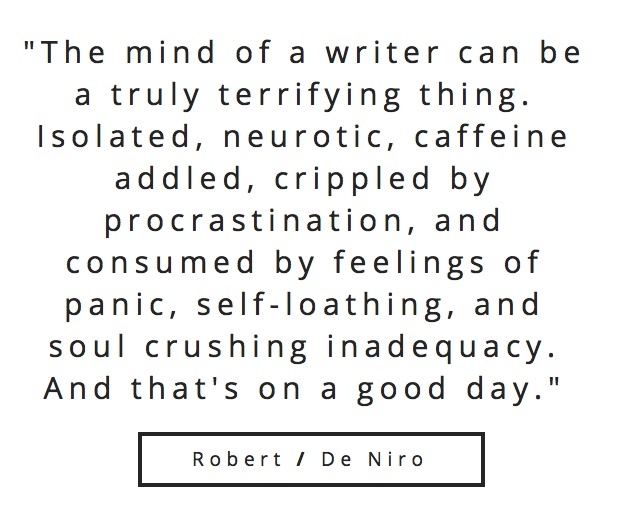 I can’t help but lift my coffee cup, and nod in agreement at his honest depiction of us writers.